Now that the days are longer, I’ve been baking more. (Hint: you can check my Instagram to see what I’ve been up to lately). Last weekend I had a chance to play in the kitchen longer. It was sunny and the weather was so nice so I left my windows open and turned on some nice relaxing music in the background. It was a perfect day to spend in the kitchen. The house smelled amazing! Buttery good, crisp, with a touch of vanilla smell. And this cheesecake is one of the things I made. Cheesecake…there’s nothing more beautiful than these cheesecake parfaits. And the best part is, they’re are not baked. Yes, no baking required and it only takes 10 minutes to prep. So you don’t need to be shy if you’re not a pro at baking. Instead, you should make this recipe and brag about it. The latter won and the rest was history. These mango cheesecakes are easy to whip up last minute, so they’re perfect for a reunion, small gathering, potluck party, or days when you crave sweets. I used a Blendtec blender to mix my ingredients and I loved the final texture of these cheesecakes–so silky smooth. And oh, did I mention skinny? We used organic ripen mangoes and they’re so sweet that no honey or sugar added to this parfait. If these parfaits don’t catch your eye, I don’t know what will. Just be sure to double the batch! “Pulse” graham crackers in Blendtec jar until they turn into crumbs and set aside. Add all cheesecake layer ingredients in your Blendtec and blend until smooth and set aside. Add 1 tbsp of graham cracker crumbs into the bottom of four serving glasses. 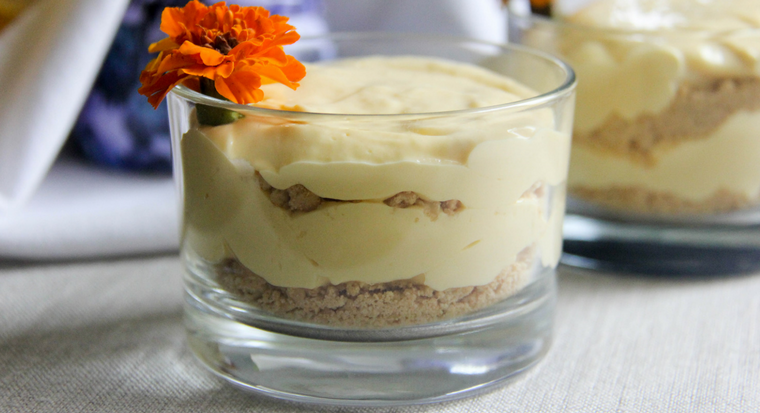 Layer mango cheesecake mixture into each glass, top with another spoonful of graham cracker crumbs. Repeat the same process until glass is full.